In the elegant De Queeste art gallery on the French-Belgian border, three artists each have a room to themselves: Francis Bacon, Louise Bourgeois and Frances Aviva Blane. A few works are also displayed in the hallway, with one by Blane at the top of the stairs. Bacon and Bourgeois have long been classics in the trajectory of 20th century art. They gained notoriety and then became part of the canon, emblematic of the discontents and traumas of the century, refracted through the lives of each artist. 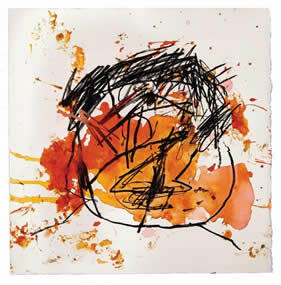 Dublin-born Bacon, slightly older than Bourgeois, was in many ways the enfant terrible of post-war British art. He made introspective interpretations of the violent contortions of the human form, reminiscent of Picasso’s fractured Cubist vision, but without the Spaniard’s political commitment. His openly gay and gambling-drinking lifestyle in London’s Soho was legendary – at a time when homosexuality was still illegal in Britain. Bacon’s meticulously-executed depictions of the isolated individual, his anguished bodies and faces are isolated and trapped in claustrophobic, eerie, often caged spaces. The anguish of Picasso’s anti-fascist Guernica mural is narrowed down to just one person, twisting and turning in different angles. Bourgeois’ sculpture and installations spoke of that which had hitherto been confined to the private and the unconscious. She brought unspeakable experiences out of the closet. She made her childhood anxieties, her anger with her philandering father into a constant source of inspiration. She became a feminist icon, championing the rights of women, lesbians, gays and transexuals right up to the last year of her life. Works on paper, in whatever medium, so often give insight into the creative process. We’re accustomed – or at least we have been before the rise of computer screen and tablet – to reading marks on a smooth white surface, as the communication of private thoughts through mark-making. 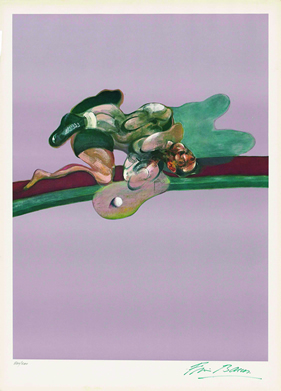 But in Bacon’s prints, due to his immaculate technique and the transfer away from painterly surface to lithographic process, the movement of the artist’s hand is invisible. This intensifies the impact of the contorted muscle-bound limbs, violet hues set against glaring oranges and pitch black shadows. 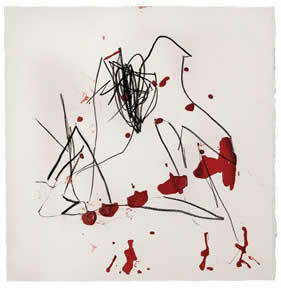 Seven prints by Bourgeois are drawn from her autobiographical suite of 1994. Unlike her best-known installations, such as Maman, the gigantic walk-through spider made for the millennial opening of Tate Modern, these drawings are mostly relaxed, gentle and humorous. They are almost like doodles, but strangely cold and distant. 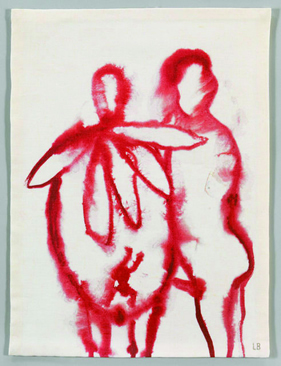 The Family, a drypoint on cloth, made when the artist was aged 95, is the odd one out, in its explicit image and freely bleeding pigment. Frances Aviva Blane’s drawings and watercolours draw confidently on the legacy of 20th century masters in their exploration of the autobiographical mode. Like Bacon and Bourgeois, she does not go for the easy-on-the-eye option. Like them she has the power to draw you in, whether you like it or not. But where Bourgeois, Bacon and others opened the doors, Blane has rushed in and taken the “confessional” mode into new, even more personal territories of the psyche. While her forbears did not hesitate to draw on, even exploit, the tortures of the flesh, she has made her own face a canvas in its own right. Not only that. There is an immediacy, a sense of the creative process going on in front of your eyes, on the paper in front of you that marks her out. Blane hates doing these heads, preferring the openness and freedom of abstraction. But as a discipline the exercise helps eschew notions of past and memory, focusing on the here and now, and what can be achieved by making marks on paper. They are about the self, unadorned, unflattering, direct, harsh. My Summer and Head 31 have a childlike, uncluttered freshness. The charcoal is scrawled and overdrawn with ferocious abandonment. The acrylic paint diluted, spattered and washed on. As in Chinese calligraphic brushwork, each touch counts, the apparently random blobs and blots are judiciously poised and rhythmic. In Drawing 3 the red spots grow in size, like a crescendo of drumbeats. There is a new, wider, more airy feel to these drawings with the addition of transparent colour washes, in contrast to the matt black charcoal. And there is an enjoyable element of chance and surprise, which gives Blane – and the viewer – a sense of the unexpected, enhanced by repeated viewings. It is a bonus that De Queeste has included two abstract oils in addition to the self-portrait heads, since Blane draws and paints in equal measure, developing a reflexive relationship with charcoal and paint where she pushes her materials as far – and beyond – where they can go. But her charcoal drawings, so often structured around her own reflection, help inform the non-figurative paintings on view in London earlier this year. By bringing together works by Bacon and Bourgeois with that of a contemporary artist, curator-gallerists Dirk and Theun Vonckx have set up an intriguing visual and historic challenge. It could have proved overwhelmingly heavy and smothering for a relative newcomer. But Blane has stood up to the test and passed with flying colours. My work is about the deconstruction of paint and personality. I draw and paint in equal amounts. I develop a relationship with the charcoal and paint, discovering marks which correspond to breakdown of self and matter. 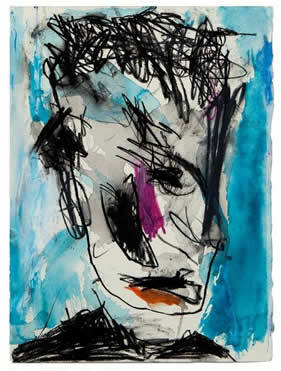 Although my paintings are abstract I make charcoal drawings of heads which inform the other. I have no idea how the paintings and drawings will look. I like to surprise myself. Things change rapidly and I'm happy with that. I want to say as little as possible about my work because painting is a particular form of communication – before speech. It is liquid thought. Louise Bourgeois, Works on Paper is at Tate Modern until 12 April 2015. Free admission.